Roughly 1,400 years ago, give or take the odd century, someone buried a collection of dazzling gold and silver near Lichfield. No-one knows why. 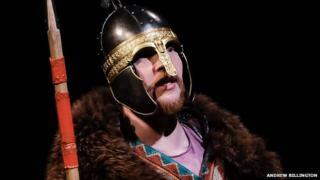 But as historians continue to pore over the Staffordshire Hoard, a major theatre festival is imagining how it might have got there. The 3,500 pieces of gold, silver and precious stone adorned the swords, helmets and armour of Anglo-Saxon warriors in the kingdom of Mercia around AD650. Why the objects were buried is still a mystery. Were they the spoils of war? Were they religious offerings? Was it a royal treasure trove? The hoard lay undisturbed until a metal-detector enthusiast stumbled across it in a farmer's field in 2009. With 5kg (11lb) of gold and 1.4kg (3lb) of silver, it was the largest haul of Anglo-Saxon metalwork ever found. Now, it has inspired 19 new plays to be performed at the New Vic theatre in Newcastle-under-Lyme in Staffordshire. The plays range from five-minute scripts to be recited in the bar to full plays that envisage how and why the treasure was buried. But do the good folk of modern-day Mercia feel a strong enough connection with their ancestors to be interested in stories about these artefacts? "I think they belong so much to a Lord of the Rings, Game of Thrones world that TV has quite helped us get a grip on that already," replies New Vic artistic director Theresa Heskins. The objects do feel like they belong to a fantasy age. There are knife handles with intricate animal patterns, a gold dragon's head with fine filigree decoration, early Christian crosses and ornaments depicting snakes, eagles and boars. One silver strip evokes ancient battles with the biblical inscription: "Rise up, O Lord, and may thy enemies be scattered and those who hate thee be driven from thy face." The hoard "lights up the idea of the dark ages", Heskins says. The festival will include four main stage plays, two studio shows, 12 short solo works to be performed in the bar, an audio piece that takes visitors around the theatre building and car park, and an animation to be shown on screens. The theatre has also enlisted 500 people, from teachers to taxi-drivers, who will wear special badges around the local area. If you spot one, they will tell a very short story about the day the hoard was found. "It is the most ambitious thing we've ever done," Heskins says. "It wasn't meant to be that at first. It was only meant to be one play." But then the director started researching the subject in earnest. "I thought, oh bloody hell, there isn't one story because people are telling me no-one knows what it is, no-one knows whose it was, nobody knows why it was there. "The thing that people most frequently said to me was, 'It can be anything you want it to be.'" At the time, Heskins was working on ideas at the National Theatre Studio in London as part of a collaboration between the theatres. By the end of the week, she had ideas for 22 Hoard-related stories. She was also struck by the difference between central London, with all its theatres working in various styles, and Staffordshire, where the New Vic is the only arts organisation to get annual Arts Council England funding. So she opted to try to give the New Vic some of the variety to be found in London. "I decided that we'd have a whole festival of plays here, all under this umbrella theme." Heskins herself has created one of the four main stage plays, Unearthed, a documentary using the words of people who have been involved in the Staffordshire Hoard story since it was dug up - from metal detectorists and archaeologists to swordsmiths and Anglo Saxon re-enactors. Two of the main-stage plays are set after the hoard was found, and the other two imagine how it got into the ground. Larksong, by Chris Bush, depicts four teenagers who steal a cache of weapons from sleeping warriors in order to stop their village from being invaded. They then remove and hide the precious bits. And The Gift, by Jemma Kennedy, suggests the treasure was at the centre of a power struggle between tribal men and women as the country converted from paganism to Christianity. Her script is written in modern English, with an Anglo-Saxon flavour. "I would never claim that my play is an accurate historical record of that period," Kennedy says. "I hope that it captures what might possibly have been some of the flavours of life at that point. "I know people were speaking a different version of English. I'm pretty sure they weren't saying some of the vernacular I'm putting into their mouths. But to me it's about atmosphere and the sensory world." The hoard was buried at about the right time for her plot to be plausible. It roughly dates from the age when the powerful Anglo-Saxon King Penda ruled Mercia, followed by his son Wulfhere, who converted his people from paganism to Christianity. "The timings would be pretty much right," says Cathy Shingler, the Hoard festival's historical adviser. "Penda's the last major pagan king. They dip in and out of Christianity." Kennedy also suggests the hoard was being used by women - who had more equality during pagan times then they would later - as they resisted the coming of the new religion. So how likely is this theory about the hoard's origin? "It's not completely impossible," replies Shingler with a smile. "Everything's going to be speculation. You're never going to be able to prove anything. It's good for playwrights. It's good for everybody. "You don't want the mystery solving. That would be boring." The Hoard festival runs at the New Vic theatre until 25 July.